A genre that is growing in popularity . . . A story that tweens and teens will love . . . A cat that I wish I could own! 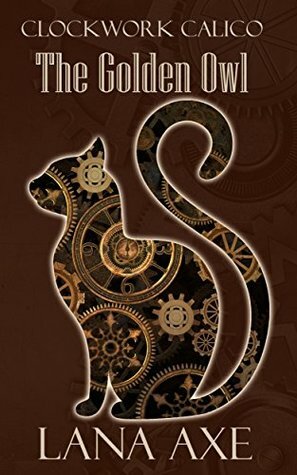 This is a great story for youngsters who enjoy a great read, an intriguing story, and a really unique kitty cat! This story is somewhere between Bolt and [the original] Inspector Gadget (I know . . . I’m dating myself a bit) with just a hint of Runaway (yeah… REALLY dating myself there). If you’ve ever seen Runaway, you’ll get it. If not… well, IMDB can enlighten you, but it’s NOT a movie for tweens or even teens so maybe just don’t. Thankfully, The Golden Owl has none of the creepiness – just the cool tech aspect! Not to mention – you have to have respect for a cat who is actually concerned and determined to rescue her [not master] human friend! Definitely recommend this book (and/or series) to tweens and teens alike! Calico Cogg is a cat like no other. Rescued from the streets of Ticswyk by esteemed inventor Lionel Cogg, she has been fitted with implants to enhance her natural feline abilities. When Lionel is kidnapped, Cali must put her skills to the test to free him. Dark schemes are in the works—a plague of tiny clockwork spiders are wreaking havoc on the city’s inhabitants. Only Cali, with help from her trusted mouse friend Emmit, can get to the bottom of it all. With a criminal mastermind planning a major heist, Cali must race against time to unravel his plot before he escapes with the city’s greatest treasure.